Haggis is a Scottish dish made of the heart, liver and lungs of a sheep or lamb, combined with oats, suet and other herbs and spices, and then cooked in a casing traditionally made of the animal's stomach. Thus, haggis is essentially a form of sausage. With that said, charcuterie, or the traditional art of sausage-making, came about as a way to utilize all the edible parts of the pig, and also to preserve it. In the case of haggis, it does indeed utilize what some culinarians affectionately term "the nasty bits." But unlike sausage, there is no thought of preserving the haggis once it is stuffed in its casing. With haggis, the feeling is one of "why wait until next week or next month to enjoy something you can serve today?" In a typical recipe, the haggis ingredients, including the organ meats, are cooked and then chopped, seasoned and enclosed in the stomach lining, which is then tied with cooking twine. The trussed haggis is then simmered for several hours. The stomach must be soaked in salted water before preparing the haggis, and in some preparations it is turned inside out before filling. The stomach must be pierced a few times before cooking the haggis so that steam will escape, otherwise it could burst. 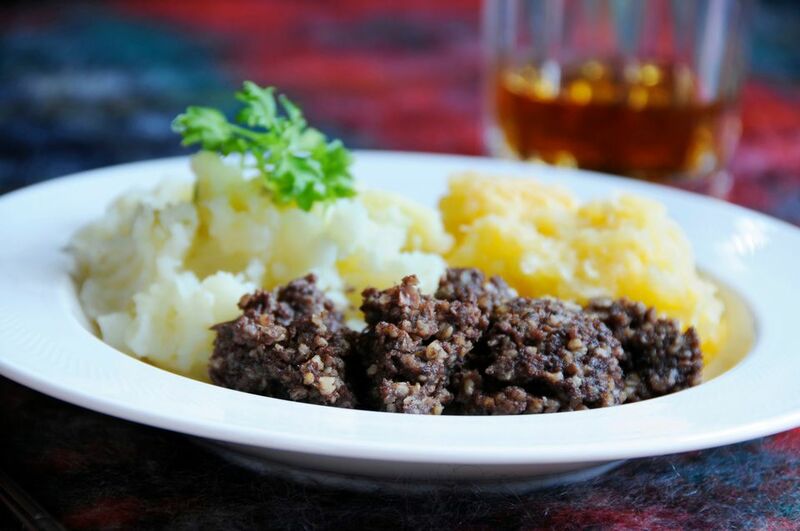 Haggis is traditionally served with mashed potatoes and puréed turnips, a combination known as "tatties and neeps." The spices used in seasoning a haggis usually include cayenne pepper, allspice and sometimes nutmeg. Bearing in mind that for the average 17th-century peasant, slaughtering a sheep was not something that happened every day. And since each sheep possessed exactly one stomach, one heart, one set of lungs, it made sense that consuming a haggis came to be considered a very special occasion. For formal occasions, the cooked haggis can be served on a platter with the stomach casing split open. Or portions of haggis can be scooped out and served on individual plates. Modern haggis recipes can involve cooking the haggis ingredients in an artificial casing, or simply baked in a loaf pan using no casing at all. Haggis is the highlight of the traditional Scottish Burns Supper, which is a celebration held on or around the birthday of Scottish poet Robert Burns. Burns wrote a poem called "Address to a Haggis" in which he praises the dish as "Great chieftain o' the puddin'-race." The haggis is carried into the dining room as the guests stand and bagpipes are played. Later, the host will recite Address to a Haggis, which is followed by a toast of Scotch whisky, at which point the meal of haggis with tatties and neeps begins. Are Sunchokes the Same as Jerusalem Artichokes? Which Olive Oils Are Considered Healthy and Low in Fat?